It's time for the June calendar, yay!!! it's June and the weather here is quite warm already. The time to hit the beaches is getting closer and closer and who wouldn't want fabulous nails to match the summer mood? So here is the June installment of the nail art diary from Nail Up! And here are this month's nail art tutorials (you can click on the photo to enlarge it). We have two lovely tutorials for this month. A pastel glittery one and a red polka dot of sorts. First you paint randomly on the nail with purple, pink and yellow. Then fill the blanks with glittery blue and green. Finally apply glitter over the whole nail and you are done. Using red nail polish do a half moon manicure. Carefully paint the half moon with glitter. Then using holographic spangles carefully make the design. That's it for this month's calendar. I have for you the first surprise mini giveaway as promised in my Birthday Giveaway post. Basically the giveaway took place during my previous post because I'm sneaky like that. If you read that post, you might have noticed that I was wearing the ring pictured below. So I decided to give away one like this to one of the lovely ladies who were kind enough to comment on my last post. There were 10 commenters and using random.org the winner turned out to be Natalie Douka from Natalie's Beauty Land. Yay!!! 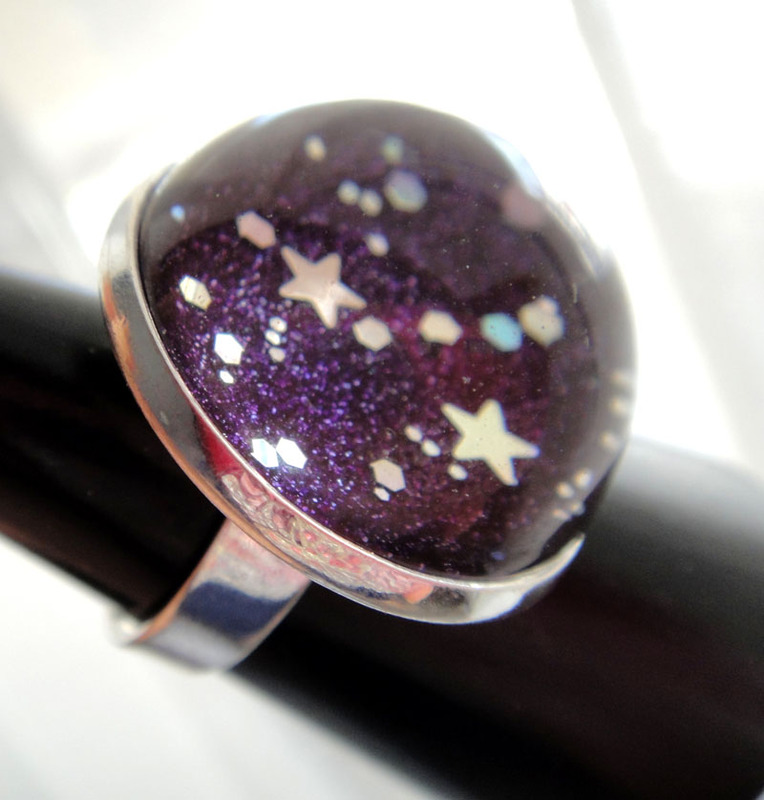 So congratulations Natalie, you won this ring! I am going to be shooting you an email right after I am done with this post! That's it for today ladies, keep an eye on my FB as the next giveaway will take place there. I have two Korres beauty packs to give away hehehe. Another month passed by so quick! I love seeing the calendar every month, it marks the beginning of a new nail polish filled month! ^_^ And the designs this month is very inspiring! The ring is gorgeous . I also love seeing the calendars every month . Oh, I didn't comment on the calendar, lol! They are all very pretty, my favorites are 11, 16, 24, 25, 27, 28. Have a nice and sunny month doll! I love al the nail designs but especially 14 and 18! τι ωραιο μπλογκ !!! και τι ωραιο δαχτυλιδι !!!!!! μετα τις 12 ε? εμενα μετα τις 5 το απογευμα συνηθως με πιανει ! χαχαχα ! that ring is adorable, congrats to natalie! and thank you for the calendar! That calendar is the coolest thing ever! I will have to look at it more closely when I am not at work hehe. Congrats to Natalie! The ring is so cute! I'm tempted to try the pastel mosaic just so I can put crack over it--I think Silver Shatter would look good on top. 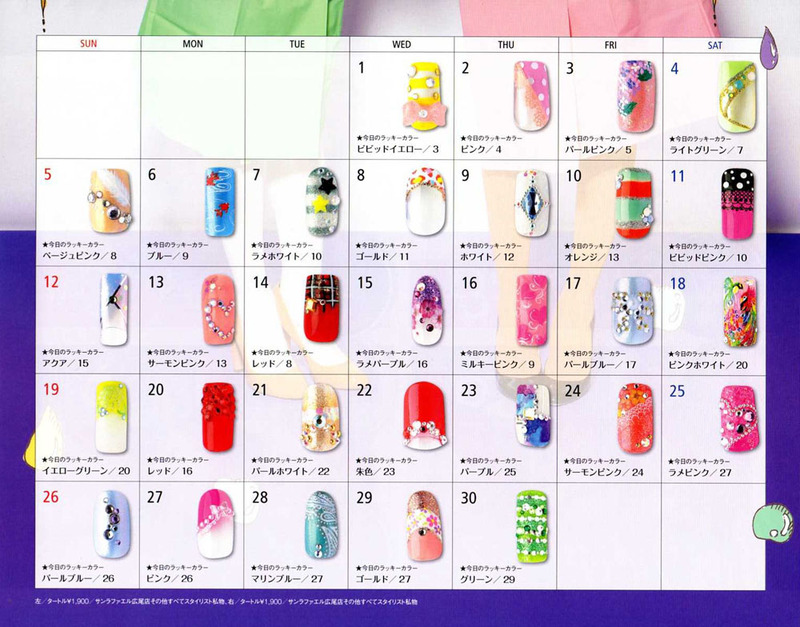 I'm so behind catching up on blogposts and only now saw this... your monthly calendars make me want to go all out and sport some serious japanese nails!!! Although, I doubt that...exam season would be the best time to wear them, haha!